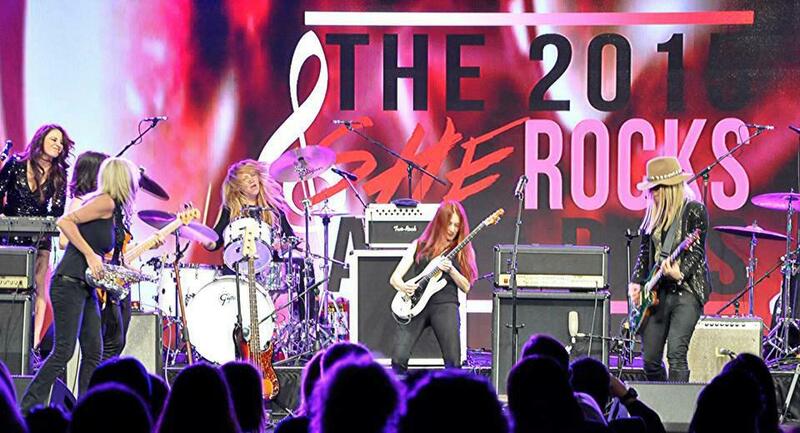 Guitarist Grethen Menn has returned to the studio and after leading the house band at the She Rocks Awards at the NAMM show in Anaheim, California. She Rocks is designed to honor and highlight women making significant contributions to the music industry. Gretchen played guitar on sets with Grammy-nominated saxophonist Mindi Abair, and jammed with Greek-Australian female guitarist Orianthi, who was selected to be in Michael Jackson’s last touring band before his untimely death. 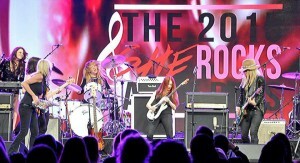 Gretchen and Orianthi were joined onstage at one point by former Bon Jovi guitarist Richie Sambora for a triple-guitar jam. Gretchen will be busy recording her second solo album as well as playing shows with her Led-Zeppelin tribute band Zepparella, and Orianthi is expected to record another album with Richie Sambora. Photo: Gretchen Menn at center with white Music Man guitar, Jenna Paone on keyboards, Angeline Saris on bass (left), Mindi Abair on saxophone, and Orianthi on guitar (right), Clementine on drums.